Compoared to the previously documented features this new version (0.2.5) adds a preliminary version of apical control and a 'Leaves' vertex group. Downloaf the installable .zip file from GitHub and read the installation instructions carefully, especially if you have installed an earlier version. Apical control (or apical dominance) is the phenomenon where buds on the end of a branch supppres the developments of bufs lower doen the branch. Often this will lead to trees with straighter branches and less side shoots. This versions contains a preliminary version but because I'm not quite satisfied with it yet I won't elaborate on it. 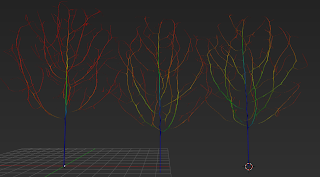 The generated tree now has a vertex group called Leaves. 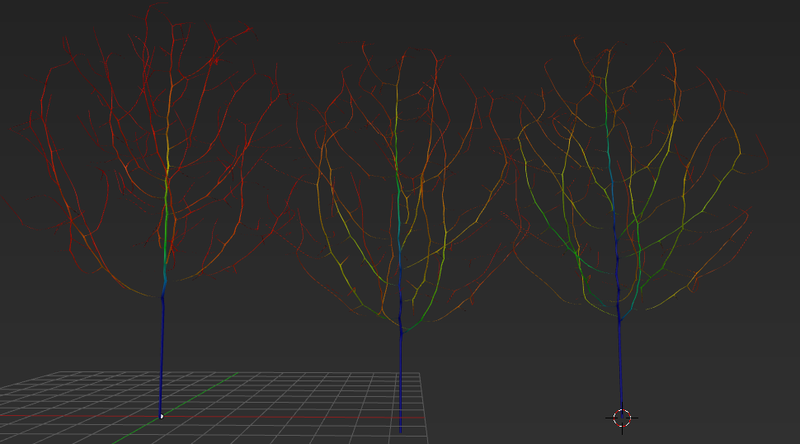 It has more weight near the end of the branches and the clustering can be controlled with the leaf clustering option. (As shown in the image below for a value of 1.0, 4.0 and 8.0 respectively). In the future we will add a ;eaves particle system as an alternative to the mesh leaves and the density of this particle system will be controlled by this vertex group. Of course you can now use this group yourself if you configure a particle system by hand. 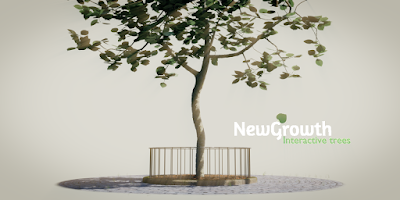 Note that without a skin the tree mesh consists only of vertices and edges (no faces) so the weights are not visible in weight paint mode although they are there. With a skin (either our custome skin or one generated with Blenders skin modifier there will be faces and the weights will be clearly visible (the skin 'inherits'the weights from the tree skeleton in both scenarios). Awesome Blog! I love blender as well! I used it in creating some shots for this Sci Fi Trailer I recently uploaded. I would love to hear any feedback on the shots if you have any.